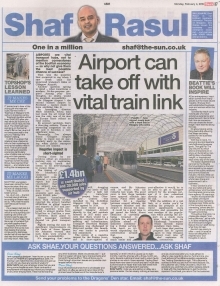 That was the question that occurred to me when I saw fresh calls for improved transport links at Glasgow Airport. Another question sprang to mind – what constitutes a modern, fit-for-purpose airport? Among your first thoughts, no doubt, would be excellent accessibility. Yet, Glasgow Airport – the second busiest airport in Scotland – cannot claim to have anything like it. Its Managing Director Mark Johnston said last week that the air travel hub was the only one of its size in Europe that’s reliant on road access. By anyone’s yardstick, that’s a worrying statistic. Throw in worsening motorway congestion on the M8 and it potentially becomes a very significant issue indeed. Personally, I’ve always found Glasgow Airport tricky to travel out of, particularly early in the morning when public transport services are limited. Getting there by car involves either an expensive parking stay, or negotiating a confusing layout that seems to be ever-changing in recent times. The timing of Mr Johnston’s comment no doubt isn’t coincidental – a new report has just concluded that the airport contributes £1.44bn to the economy and supports 30,000 jobs. Airport consultancy firm York Aviation further reported that the airport handled £3.5bn in global imports and exports in 2017 and that passenger numbers were projected to almost double from 9.7 million to 17 million a year. However, those plans to grow passenger numbers depend on good surface transport links. Rightly stating the case for significant improvements on the back of those figures, Mr Johnston warned that such links were crucial to its future sustainability. It’s staggering that we’re still dragging our heels on this clear no brainer after a light rail or tram/train project from Glasgow Central was included in the £1.1bn Glasgow City Deal, originally agreed in 2014. The most recent plans to connect Glasgow Airport directly to the rail network faltered in 2017 amid concern that there would be a negative economic impact for existing rail infrastructure. Transport Secretary Michael Matheson was challenged in Holyrood earlier this month over the much delayed project, but was loathe to provide any assurances. The notion of a negative impact for the Paisley corridor is short-sighted of course, and Mr Johnston said as much with his remarks last week. The good news is that those remarks have spurred officials into action – plans were quickly hatched for a meeting between council officials, the Transport Minister, and the airport to discuss the issue. It could be a good time to get round the table. Some £8m is currently being invested to upgrade the Glasgow Airport’s facilities ahead of Emirates commencing a Dubai service from April, so it’s worth expanding the conversation around that. Imagine how much easier and cost-effective it would be to be able to get to Glasgow Airport for the average person if it was connected directly to the city centre by rail. For those travelling to the airport by car, the thought of a big taxi fare or long-stay parking fees can be enough to make them reconsider their entire flight plans. With the addition of a rail link, at a stroke you’d be making the prospect of air travel significantly more attractive and accessible for vast swathes of the population while simultaneously putting the airport on a much more even footing with its Edinburgh counterpart which already enjoys excellent tram links. Let’s hope that positive progress can be agreed upon to help Glasgow Airport truly take off and maximise its connectivity. As an entrepreneur, inspiration comes from many places. But the most valued business insights I find come from well-established business men and women within the industry. I constantly reach out to individuals who have extensive experience and expertise and I like to think that I too am someone who can share the knowledge I have learned along the way with upcoming moguls. It’s about giving something back and ensuring that ideas are being pooled for the betterment of the business community. With that in mind, I’m enjoying Gordon Beattie’s new bite-sized business book, Thought For The Day Volume lll, which allows entrepreneurs to enjoy an illuminating marketing idea, a business insight, or inspirational story every day of the year. The easily digestible tips penned by the Beattie Communications founder are inspired by his experience in the public relations and communications industry. It’s like a little calendar of wisdom from one who’s been there and experienced it all in business. In fact, Gordon is a former journalist who founded the integrated communications agency 33 years ago. It now has 130 staff in offices all over the UK and Canada. Gordon is also a serial entrepreneur himself with investments in numerous business ventures including a travel insurance firm, a whisky retailing business, and a ferry company. I expect his experiences and ideas will inspire debate amongst marketing professionals. While some of the thoughts are very interesting, others are divisive - but all are certainly thought-provoking. Throughout the book, he challenges classic ‘marketing baloney’ as he calls it, and instead advocates ‘Supreme Simplicity’ – a laudable aim. It’s also refreshing that all of the book’s images feature his own staff doing what they do best. Gordon’s expertise is undoubtedly a welcome addition to the business community’s collective knowledge. He has plenty to offer – and I’m sure he would be delighted if it inspired your own thoughts in return. Scottish youngsters have been busy voting for their favourite jokes, and trust me, you will not be disappointed. They of course involve toilet humour which is always a favourite with kids and dads alike. Arguably, the funniest result from the survey was that despite the typical, cringe-worthy dad jokes, almost half of kids said their dad was the funniest person they know. Here, here. It pained me to hear of the young girl who was seriously harmed whilst in Topshop at Glasgow’s Silverburn shopping centre. It has been reported that Topshop’s owners will be fined £450,000 after she was seriously injured by a barrier which fractured her skull. The child had been swinging on the barrier when it fell on her due to it not being secured to the ground, making it the retailer’s failing. In 2019, it’s a given that retailers have a responsibility to their customers to ensure their safety whilst instore. That must include anticipating all possible scenarios, particularly when children are out shopping with their parents. We need to hope is that Topshop owners Arcadia Group have learned their lesson – and all retailers are taking note of the consequences.